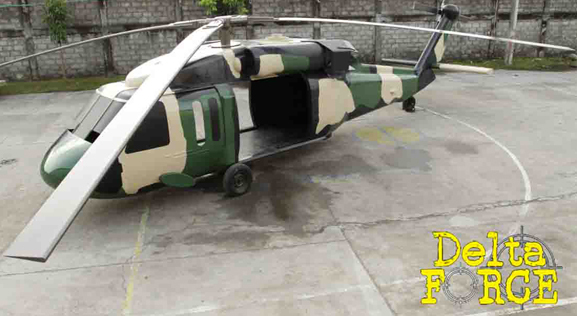 Arriving under a veil of secrecy, the world’s largest Paintball company; Delta Force Paintball; has just taken delivery of an amazing full scale replica of a Black Hawk Helicopter. It is destined to take pride of place at one of our eight, state of the art paintball theme parks across Australia and New Zealand. Shipped in a 40 foot container from its top secret manufacturing facility, the stunning replica boasts some staggering dimensions. It is over 15 metres long, 3 metres wide, has a 16 metre rotor span and weighs about 2 tonnes. It can hold up to 15 paintball‐ready troops. Delta Force Paintball has been operating in the UK for over 23 years, but only made its Australian launch in 2009. Delta Force recognised a need in the leisure industry for quality outdoor entertainment facilities and powered ahead within three short years to open 5 showcase centres around the country. Two more are due for completion before the end of 2012 and a centre in Auckland, New Zealand was also opened in 2011. These centres are like no others seen in Australia. They transform real‐life, movie and gaming themes into scenario based outdoor adventure. Contracting local companies they design and build the game zones themselves, for example, ‘London after the Apocalypse’ complete with authentic double‐decker London bus, ‘Tomb Raider’ with huge stone pyramid and sphinx, and ‘Dodge City’ with wild west town streetscape. But, it is Delta Force’s more recent concept that will have paintball enthusiasts lining up to have a go. No other paintball operator has ever gone to these lengths to create such realistic props for their centres. The 100+ Delta Force employees across Australia can take enormous pride in being a part of such success. 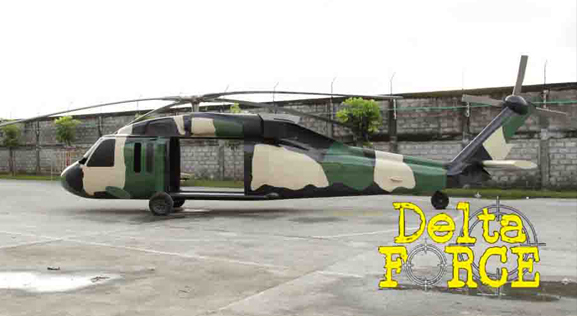 Delta Force Paintball has not yet revealed the Black Hawk’s final destination.